In July, Jason Briner (State University of New York, Buffalo) and Darrell Kaufman (Northern Arizona University) spent three weeks working in the Kurupa Valley in the western Brooks Range as part of a pilot study funded by the National Science Foundation to assess how Alaska’s climate and glaciers have changed over the last 10,000 years. Briner, Kaufman, and graduate students Mike Badding (SUNY Buffalo) and Brandon Boldt (NAU) put in by float plane and established a base camp in the Kurupa Valley. 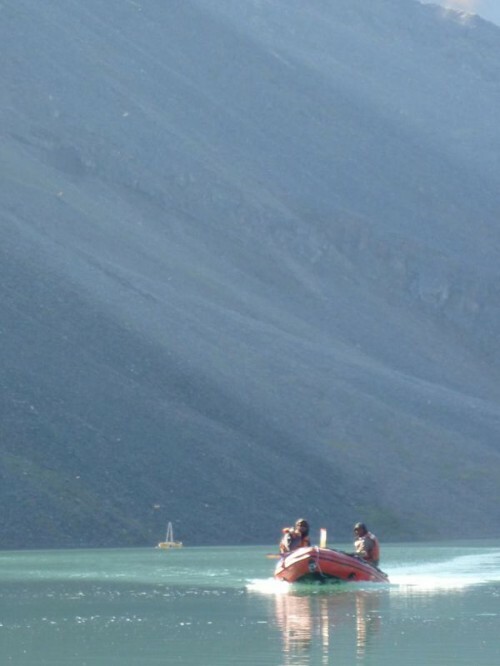 Using a fish-finder mounted on a Zodiac inflatable boat, they zig-zagged back and forth across the Upper Kurupa and Kurupa Lakes, mapping the lake bottom topography. After choosing coring locations, the scientists anchored their “cataraft,” two rubber pontoons bridged by a plywood coring platform, to hold steady in often windy conditions. Using Briner’s trusty “percussion system,” corers spent an hour or two hammering a core tube into the lake bottom through a tripod and a hole in the platform. Ordinarily, cores tubes are three meters, but this year, the team acquired seven meter cores using a custom-made corer extension dubbed the "Kaufman Kontraption" (or KK for short) for its designer. Once the core was pulled up, the team capped it, carried it ashore, and split it lengthwise for inspection before packing it for eventual shipment to the universities. Back in the lab, the team is examining cores for organic content (preserved vegetation can be used for radiocarbon dating) and for volcanic ash layers, which can be chemically dated and correlated to other Alaskan lake cores. The group also worked in the upper Kurupa Valley, collecting hand-sized rock samples for Beryllium 10 exposure dating, a chemical method that will help Briner decipher when and how quickly Kurupa Valley glaciers retreated. As glaciers advance and retreat they deposit piles of rock debris, called glacial moraines, which are often reworked during younger and larger glacier advances. Consequently, glacial landscapes are not often preserved for longer than 500 years. The Kurupa Valley is unique because younger glaciations—those that came later than the one under study—covered less area, leaving moraines as old as 5000 years preserved in the valley.